(5) for relief under Rule 60. (C) the court denies all relief. (B) the court grants other relief not described in this subdivision (b). (B) 150 days have run from the entry in the civil docket. (d) Request for Entry. A party may request that judgment be set out in a separate document as required by Rule 58(a). (e) Cost or Fee Awards. Ordinarily, the entry of judgment may not be delayed, nor the time for appeal extended, in order to tax costs or award fees. 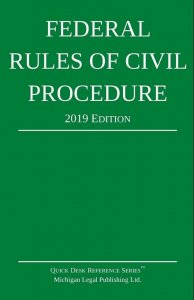 But if a timely motion for attorney’s fees is made under Rule 54(d)(2), the court may act before a notice of appeal has been filed and become effective to order that the motion have the same effect under Federal Rule of Appellate Procedure 4 (a)(4) as a timely motion under Rule 59.